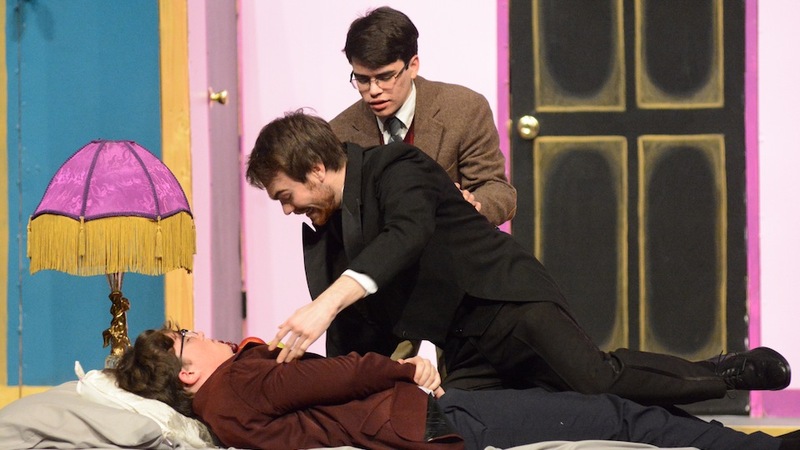 McNary senior Jon Taylor can relate to Max in Lend Me a Tenor, an assistant to the general manager of the Cleveland Grand Opera Company who is thrust to take center stage after a series of unfortunate events strike a world-famous tenor. Since moving to Keizer from Maryland, Taylor has spent the past two years off stage working on the technical side of McNary’s productions, building sets and programming lights. Taylor’s only unfortunate event was missing the stage manager meeting. Instead, he decided to audition for McNary’s One Act Festival. But to his surprise, Taylor was called back for Lend Me a Tenor. Lend Me a Tenor opens in the Ken Collins Theater on Friday, Feb. 23 at 7 p.m. Additional shows are Feb. 24, March 1-3 at 7 p.m. and March 3 at 2 p.m.
General admission tickets are $5 for students and seniors and $7 for adults and available at the door or in advance at mcnary-theatre.ticketleap.com. As Max, Taylor spends the first act of the play running around looking for Tito Merelli, the greatest tenor of his generation. After accidentally giving Tito a double dose of tranquilizers in an attempt to calm the singer down, Max is persuaded to get into Tito’s costume and fool the audience into thinking he’s the tenor. Taylor wasn’t the only cast member of Lend Me a Tenor who though they were auditioning for one acts. Freshman Elise Myers, who plays Maggie, the daughter of Saunders, the general manager of the opera company, who is Max’s girlfriend but also infatuated with Tito, was also surprised to get called back. “That really surprised me but I was really happy,” said Myers, who was in the ensemble for The Wizard of Oz at McNary and the cabaret as a student at Whiteaker Middle School. “I try to cast on based who I think is right for the roles and just something about her really fit the role and the qualities I was looking for,” McNary drama director Tom Cavanaugh said. McNary senior Matthew Albright plays her dad—Saunders. The rest of the cast includes Steven Cummings as Tito, Sydnie Gould as Tito’s wife—Maria, Bella Fox as a seductive opera singer named Diana, AB Feinauer as chairwoman of the Cleveland Opera Build—Julia and Rachel Herriges as a bellhop who’s also an obnoxious opera fan. The play takes place in 1934 in a hotel suite in Cleveland, Ohio. The set includes a bedroom and living room, with a wall dividing each room and door leading from one to the other. Throughout the play, the audience can see what is happening in both rooms at the same time. Lend Me a Tenor is written by Ken Ludwig and received nine Tony Award nominations when it premiered on Broadway in 1989. The play is rated PG-13. “We’re doing a straightforward interpretation of what the script says,” Cavanaugh said.